Colors in old photos and chroma films inevitably fade or distort over time. The exact type of degradation largely depends on the type of film, the storage conditions and the age of the picture or video. Usually it is possible to estimate this distortion and reconstruct the original colors with high precision. We offer a set of algorithms for restoration of colors in video and images digitized from degraded films and photos. 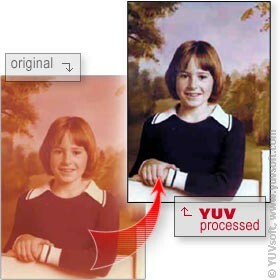 These algorithms enable automatic or semiautomatic color enhancement in digitized pictures.